If you have seen gargoyles, you are already acquainted with the grotesque (from the Latin: grotto [caves]). 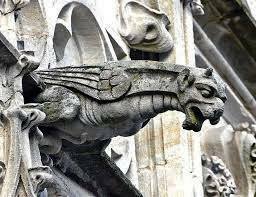 Gargoyles (gargouilles) are ingenious drain spouts, or water spouts, built in the shape of grotesque animals. They prevented and still prevent the erosion of exterior walls. Most gargoyles are zoomorphic. You may find books, articles and internet sites that challenge the above classification, i.e. anthropomorphic versus zoomorphic. My classification is based primarily on the physical attributes of an animal in literature or art. If the animal combines the features of various animals or is both beast and man, that animal is first and foremost zoomorphic. Other considerations are secondary. The amphisbaena, with the small head seeming to threaten the large one. Misericord; Limerick Cathedral (St. Mary’s), Limerick, Ireland; late 15th century. A dragon with four legs and bat wings. Misericord; Cartmel Priory, Cartmel, England; late 14th century. Two doves biting at foliage. Misericord (number 30); Exeter Cathedral, Exeter, England; third quarter of 13th century. 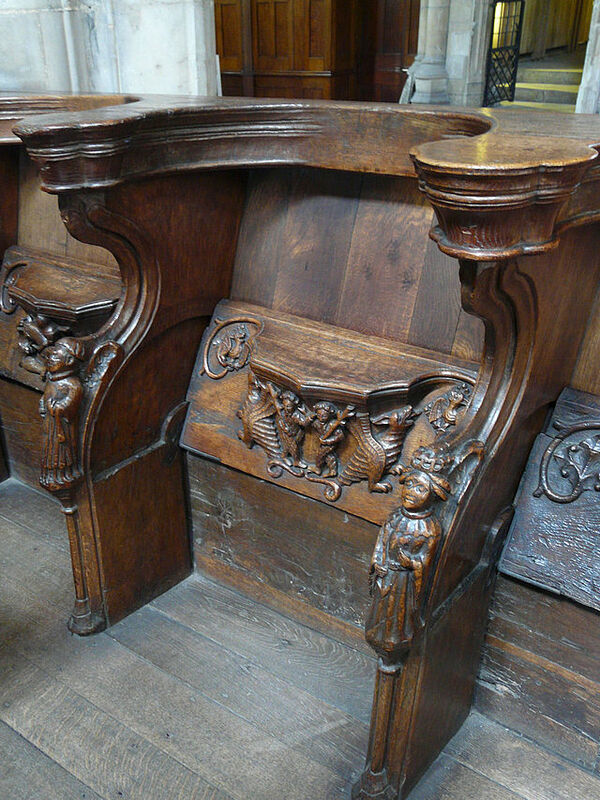 As for Misericords (from miséricorde [mercy]), they are ornamented “mercy seats,” narrow wooden seats that fold up when they are not in use. 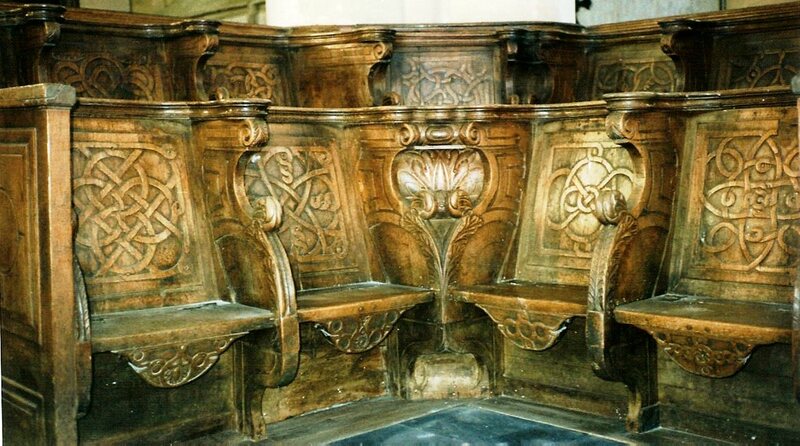 Consequently, the carvings are underneath the seat and hidden when the seat is folded down. It seems they were first used as choir stalls in the quire, by monks living in monasteries and observing the Canonical Hours. Monks who lived in a monastery were called Cenobites. Several monks were recluses and were called eremitical. Others live in a small group. The Benedictine order, or confederation, is 1,500 years old. It was founded by Saint Benedict of Nursia (c. 480 – 543 or 547). Benedictines have therefore sung the eight Canonical Hours, Christian horae, for centuries, which meant standing up for a long time in choir stalls, hence our “misericords,” or mercy seats. Some monks could survive the ordeal, but many couldn’t. 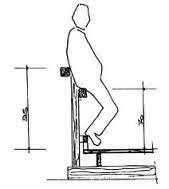 A way of sitting while standing was therefore devised, much to the benefit of church architecture and art. 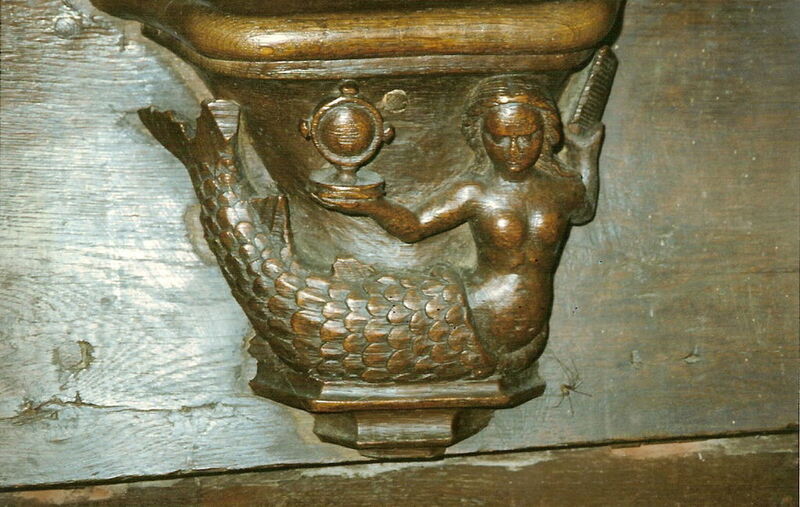 (See Misericord, Wikipedia.) In the Byzantine rite, Eastern monasticism, a misericord is called a kathisma, literally a seat, but it is not as ornate as misericords. In the Western Church, cathedra also means a seat. Cathedrals are the seat of a bishop. Interestingly, Eastern monasticism precedes Western monasticism. In Western monasticism, monks have used Gregorian chant, a plainchant (unison), as opposed to polyphonic compositions. Gregorian music was developed by Saint Ambrose (c. 340 – 4 April 397) and, to a larger extent, by Saint Gregory or Pope Gregory I (c. 540 – 12 March 604). 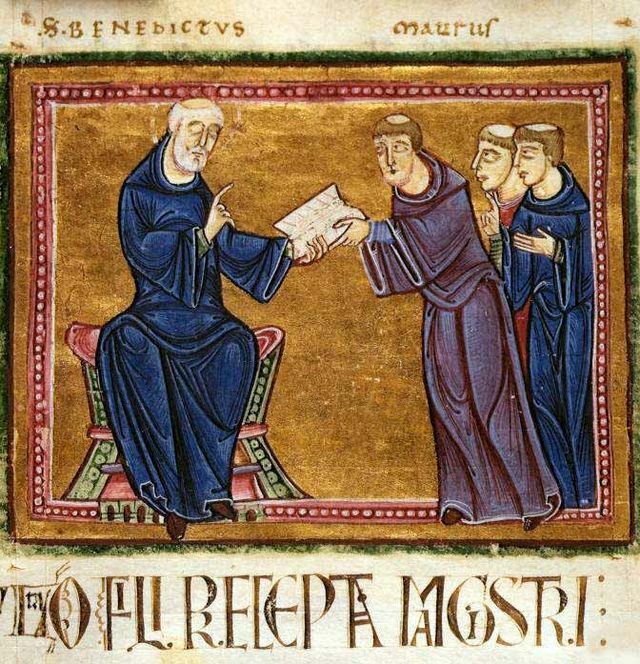 Benedict of Nursia wrote the Rule of Benedict, a text which many consider foundational to monasticism in general. The Rule of Benedict is observed by other monastic orders as is the Rule of St. Augustine, written by Augustine of Hippo (13 November 354 – 28 August 430). I saw several misericords at Beverley Minster, in the Yorkshire. Ironically, Beverley Minster is the church where a large number of my husband’s ancestors have been laid to rest. 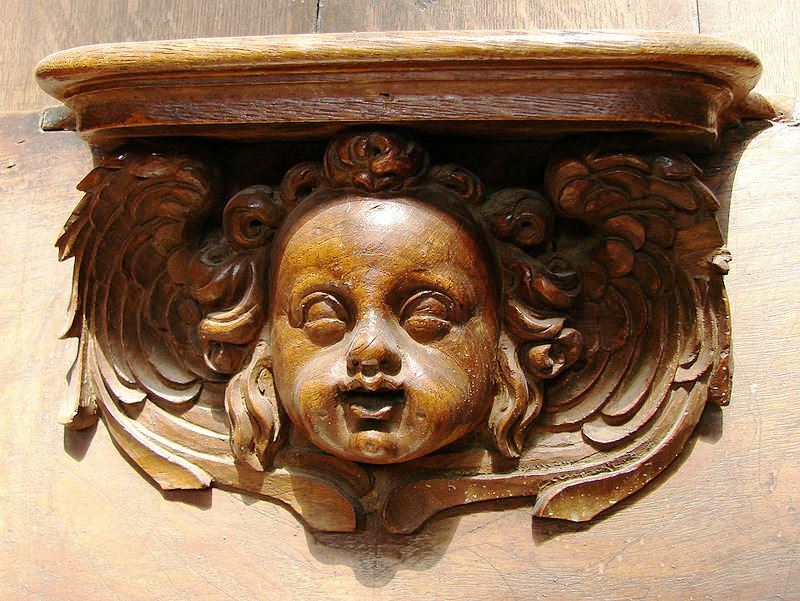 I also saw several misericords in the “cathedral” at Coutances, in lower Normandy, where we lived for nearly a year. Many of Beverley Minster’s misericords are sexually explicit and some, quite repulsive. One does not expect to see such carvings in a church or a cathedral. 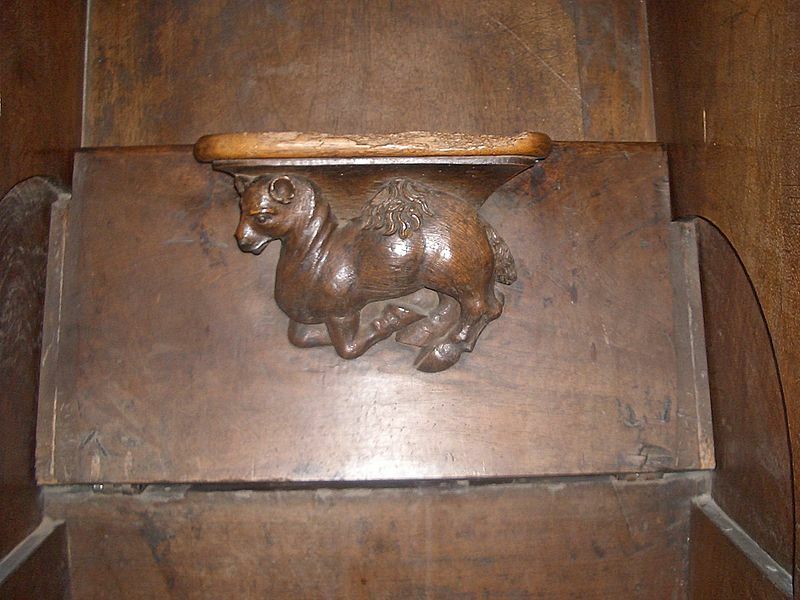 Misericords often featured animals from Le Roman de Renart (Reynard the Fox). I have seen pictures of these, but Reynard misericords and misericords on fox lore require their own post. Both gargoyles and misericords, gargoyles mainly, are architectural and functional elements, but ornamented. They do, however, revisit our standard or “classical” view of beauty. There was a revival of the grotesque in 19th-century France and elsewhere. Romanticism was, to a large extent, a rejection of the classicism of the 17th and 18th centuries, considered a foreign element. The grotesque and the Gothic (fiction, architecture, and the Gothic revival) are related to one another. 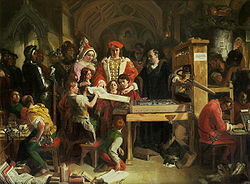 Victor Hugo‘s 1831 Hunchback of Notre-Dame (Notre-Dame de Paris) is one of the foremost literary examples of this blend. Notre-Dame de Paris will be discussed in a future post. Many were destroyed with the rise of Protestantism and through acts of vandalism. There are modern misericords, but they are not included in G. L. Remnant‘s 1969 catalogue, reissued in 1998. They are a collector’s item and most are beautifully carved. The Coutances choir stalls, shown at the top of this page, also feature the endless knot motif, a characteristic of Celtic art. With my kindest greetings to all of you. Elaine C. Block and Kennett Varty, “Choir-Stall Carvings of Reynard and other Foxes” in Kenneth Varty, ed. 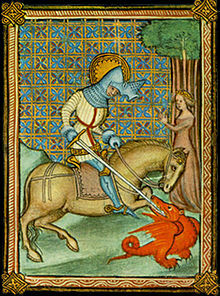 Reynard the Fox: Social Engagement and Cultural Metamorphoses in the Beast Epic from the Middle Ages to the Present (Oxford & New York: Berghahn Books, 2000), pp. 125-163. G. L. Remnant, Misericords in Great Britain; with an essay on their iconography by Mary D. Anderson. (Oxford University Press, 1998 ). If the myth of the phœnix did not exist, we would probably invent it. Mythical and legencreatures are usually born of a human need, which, in this case, is the need for rebirth. 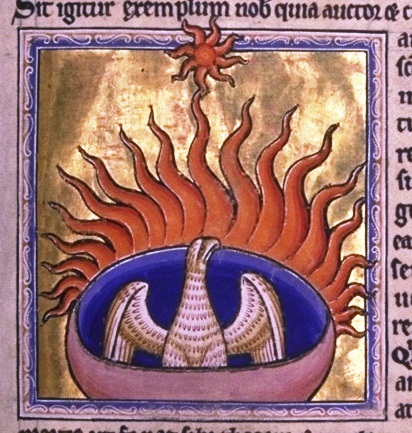 Moreover, given that the Phœnix is a transcultural and nearly universal figure, we can presume that the need for rebirth is widely and profoundly rooted in the human imagination. 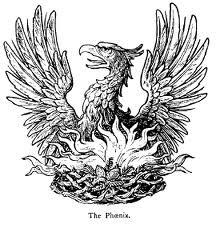 The phœnix was used by J. K. Rowling in the fifth book of the Harry Potter series: Harry Potter and the Order of the Phœnix, 2003. 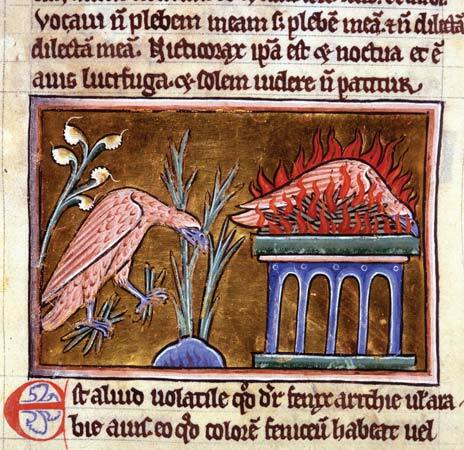 It is also featured in Jean de La Fontaine, “Le Corbeau et le Renart,” (Book I.2), or the “Raven and the Fox,” where the Fox tells the crow that because of its beautiful voice, he is a phœnix among the guests of forests: “Vous êtes le phénix des hôtes de ces bois.” In French, blackmail is translated by le chantage. The fox makes the corbeau sing and the cheese drops. We cannot escape death as we are mere mortals, but life is nevertheless perpetuated. Outside my window there are naked trees, but they will again be adorned. And even if one’s land is a paper land, a literary homeland, that too is a land. In 1889-1890, Henri-Raymond Casgrain, the author of Pèlerinage au pays d’Évangéline was President of the Royal Society of Canada and therefore lucid. Yet there is no “real” Évangéline. She was created by American poet Henry Wadsworth Longfellow, in 1847.